Obituary – Jordan, Kimberly Kay (Bezdicek) « Perry High School Alumni Association, Inc.
﻿Stageband 74-78, Band 74-78, All School Revue 74-78, Choir 75-78, Maroon Double Sextet 76-77, Double Sextet 77-78, Bear Neccesities 76-78, Bye Bye Birdie 77-78, Thespians 75-77, FTA 75-76. Mrs. Richard (Kimberly Kay) Jordan, 22, 225 Ash street, died at her home at approximately 11 p.m. Friday. Funeral will be at 2 p.m. Monday at the First Christian church. Officiating will be Rev. M. R. Work. Burial will be at Grace Hill cemetery under the direction of Parker Funeral home. Mrs. Jordan was born in Perry Oct. 11, 1959. 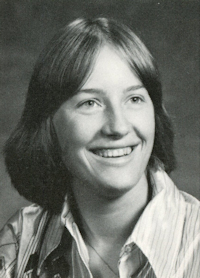 She graduated from Perry high school in 1978 and was married in Perry Aug. 9,1980, to Richard Jordan, who survives. She was a member of the Christian church. Survivors other than her husband of the home include her parents, Mr. and Mrs. Charles Bezdicek, Perry; a sister, Mrs. Tana Fraire, Perry; a brother, Robert Dean Bezdicek, Arlington, Texas; paternal grandparents, Mr. and Mrs. Joe Bezdicek, Perry; and her maternal grandmother, Mrs. Martha Spillman, Perry.